You can create aliases for modded blocks to use them in your recipes too. These recipes also includes smelting, and creating fuels for the furnace. Custom Recipes loads recipes from a file within your computer, and loads them every time you enter a world. It also provides a log for you to debug your recipes if something went wrong. 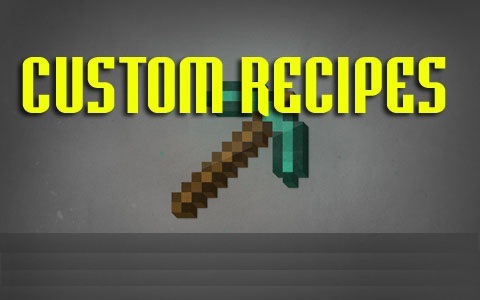 With custom recipes you may also remove existing recipes, and it works completely with mods. Therefore it is very useful in modpacks, where you might want to change some recipes for balancing, and disabling crafting of certain items on your server. Recipes can be saved in any text files in .minecraft/mods/customrecipes. You can also use comments to make the code cleaner. General notice: To get modded blocks, simply use their id like this: *pipe=185, and then use keyword pipe. For items, you may or may not have to add 256 to the item id, if its 5000 in property file, use *explosiveEgg=5256. meta and count are optional. Shaped recipe consist of recipe (left) and result (right). m = meta / damage value. This is used, for example, to determine leaves, wool and dye colour. count = number of items produced, default is 1. Recipe rows (the name+name+name pieces) are divided by either ; , | or /. All rows must have the same size. Use “null” , “none” , “air” or “nothing” in empty slots. Shapeless recipe has only one “row”, with up to 9 items. Smelting recipe can have only one item on left, and can’t specify it’s meta. Name is an alias or item ID, and burntime defines how long this item should burn. Stick has burntime 100, planks 300, coal 1600, lavabucket 20000. If you write some super large number here, you will have nearly infinite fuel. Removes all recipes that would craft the specified item, no matter how many or what metadata. This is an alias definition of new block or item. Alias can contain letters, numbers and underscore. ID must be a number. Aliases are defined in the dictionary, but you can define your own in your recipe file. This is how you can make comments in your recipe files. Comment doesn’t have to start on new line, but all from the # sign till the end of line is treated as a comment. For those who don’t like brackets: Don’t use them! This works (or may work) too. You can post the recipe packs as new mods here, just tell users to download this mod. To upload your recipes, ZIP them! If you run minecraft from command line, you get error messages that will help you debug your recipes. These debug messages can also be viewed in the log file. Spaces are ignored in the recipe files during execution, thus you can use spaces for formatting.